So you haven’t heard from us in a while. I claimed we were alive and then disappeared again. I wanted to give you an update on where we have been. I had the best of intentions of getting back to blogging. Taking care of my Grandparent’s house continued to occupy all of my time so that didn’t happen. If you have been following us on Facebook you know that I spent almost two months living away from home, clearing out the house and having an estate sale. Gretel lived with me while Chester stayed home to keep Daddy company. We did manage to fit a couple of adventures in, although I had to miss several of the events I scheduled for the Adventureweiner Club of Seattle. We went for a hike with the group and then hosted a Weiner-Q at our house afterward. Gretel and I went for a hike to Glass Beach again to find more beach glass for my wedding favors. I have been consulting, and remotely operating a Business Facebook Page, for a local, independent Seattle pet food store while over at my Grandparent’s house. Since I have been back in Seattle I have helped out with a couple of events at the store, acting as the official photographer and Facebook community promoter. I started my own dog walking business. I already have three doggie clients. One of my personal goals was to walk more so this new venture is helping my health out too. 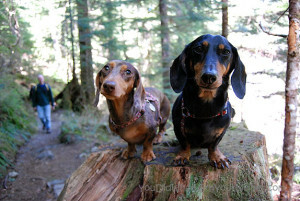 We went for another hike with the Adventureweiner Club yesterday. We only got a couple of pictures because it was raining. We posted them on our Facebook page. Tomorrow I start packing for BlogPaws. We are leaving with our friends from It’s a Weinerful Life early Thursday morning and driving all of the way through to Salt Lake. We will be pulling into KOA in the evening just in time to put up our tent and pass out. We are super excited about the road trip! I won’t be posting on the blog again for a few days but I assure you there will be plenty of updates from the road and from the BlogPaws conference itself. I will recap the whole trip here when we get back. Life does get busy sometimes doesn’t it! You’ve got lots going on for sure but it was good to hear from you. Hope you have a terrific time at Blog Paws! Hey, thanks for remembering who we were and stopping by to say hi. Ha, ha. Good to hear from you; Gretel looks terrific! Have a great time at BlogPaws – hoping to go next year. I’ll be looking for you at BlogPaws! I hope you have a safe trip! Thanks for sharing these gorgeous photos! I hope things settle down for you soon in a more positive fashion. It sounds like many of the things keeping you hopping are happy ones. I hope you have a terrific time at the conference! Welcome back. Have a safe trip to SLC. We will be there too. I’ll have Kendall the Cavalier with me. Welcome back! Have a safe trip to BlogPaws. By the way, what kind of camera do you use? Thanks Nola’s Mom 🙂 I can’t wait until I have time to check your blog out again. I miss you 🙂 I use a Nikon D80 with just the standard lens…although I recently got a 50 mm 1.4 portrait lens I am learning to use. None of the pictures in this post were taken with it though. Loved the pictures! Can’t wait to hear about your trip! Glad you’re back in the blog world! Easy to see why you haven’t been blogging, you have been busy! I look forward to hearing about Blogpaws! Glad to hear you’re doing well … and have a great trip! Super cool to see you back in blogland…2 months of a lot to do…no wonder you couldn’t find time to post…that’s OK. I love that Glass Beach post…we have spent the passed 3 years going to beaches in Nova Scotia and Prince Edward Island looking for glass. It is a great outing and exercise even if you get a crick in your neck! Have a great trip to Salt Lake…now that would be a blast and 1/2! Wow, you pack a lot into two months. Hope you’re not too exhausted from the long drive to have fun at BlogPaws. Thanks for the update and the beautiful pictures. Safe travels.